1. In very large skillet heat oil over medium-high heat; reduce to medium. Add chicken. Cook 6 minutes; turn. Add mango cubes, mango drink, and chutney. Cook 4 to 6 minutes or until chicken is no longer pink, stirring occasionally. 2. Meanwhile, place zucchini and 1/4 cup water in microwave-safe 2 quart square dish. Cover with vented plastic wrap. Micro-cook on 100 percent power (high) 2 to 3 minutes, stirring once; drain. 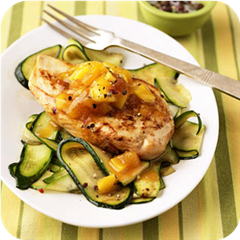 Place chicken on top zucchini. Season with salt and crushed red pepper. 3. Test Kitchen Tip: Mango nectar, carrot juice, or orange juice may be substituted for the mango-blend drink.